My family is all about a good casserole, especially when it gets cold outside. Well, it’s been snowing here for almost 24 hours and my thin desert-climate blood had left me chilled and with a hankering for some good comfort food. 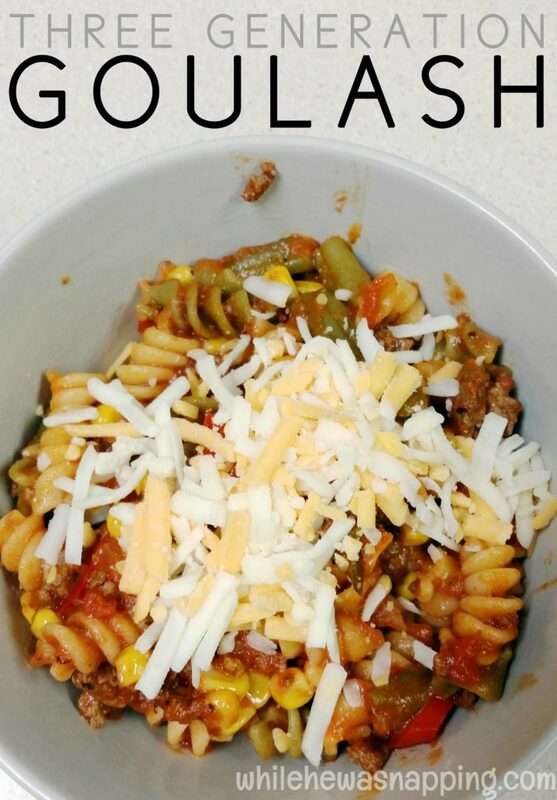 Goulash is something I ate growing up and I remember more than one family dinner gathered around the dinner table, discussing our days over a plate full of my mom’s goulash. 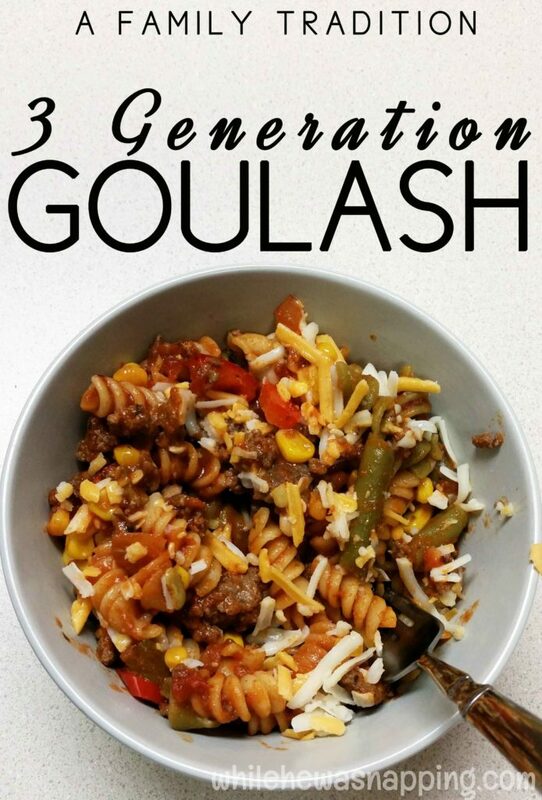 However, this is three generation goulash and my mom and I are only two generations. I love that the third generation is my grandma, my dad’s mom. This recipe takes the best of my mom and the best of my grandma and a few things I love and combines them all together. Two amazing women helped shape this recipe and make it the scrumptious dish that it is. It’s pure comfort in a bowl. And you probably have the ingredients in your cupboard and refrigerator RIGHT NOW. 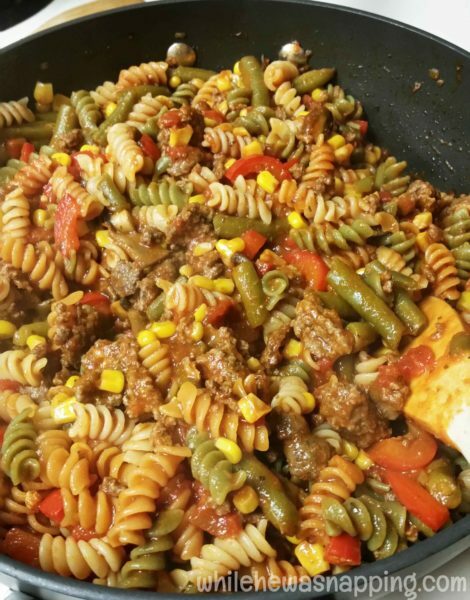 Some veggies, ground beef, pasta and Ragu Pasta Sauce, that’s it. Let’s get cookin’! A hearty casserole-style dish with lots of flavor. 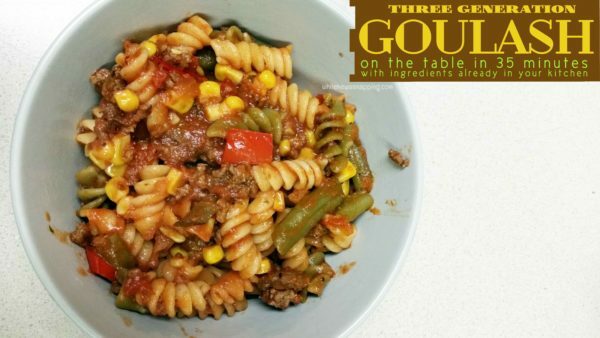 Pasta covered in flavorful tomato sauce with vegetables and hamburger make this a wonderful family favorite. Boil water for the pasta as directed on the box. When water boils, cook the pasta as directed. 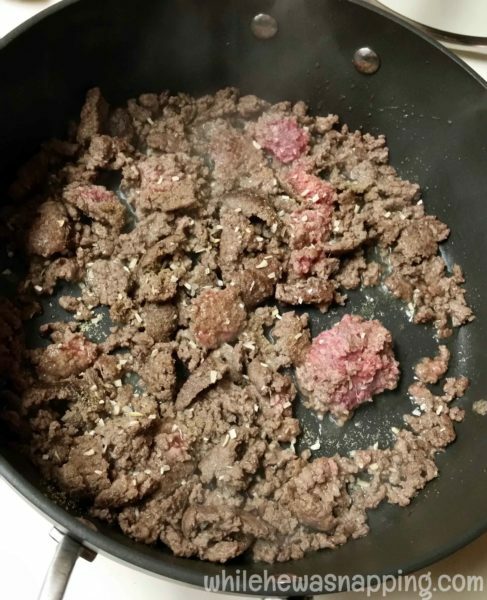 Brown the ground beef in a skillet on the stove. Add the garlic powder and the minced onion. 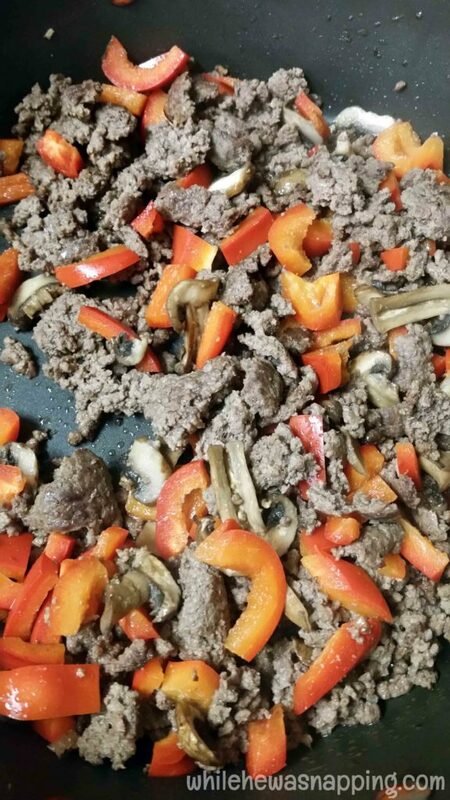 Slice the pepper and mushrooms. Add to the ground beef. Saute until the mushrooms and peppers are tender. 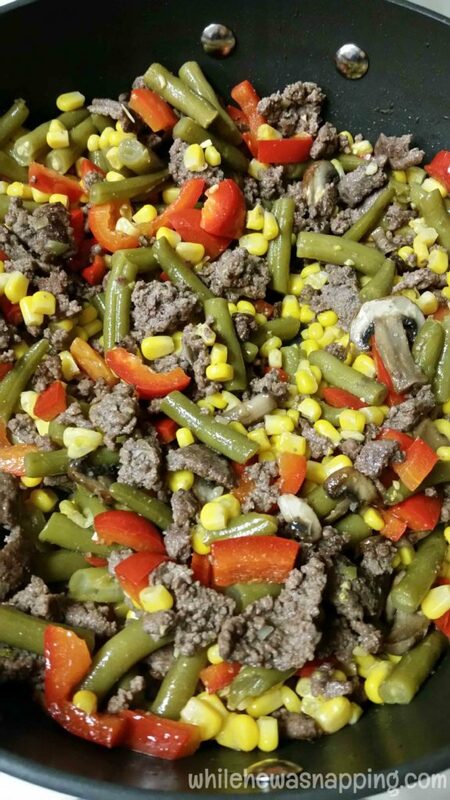 Add the green beans and the corn. Combine until well mixed. 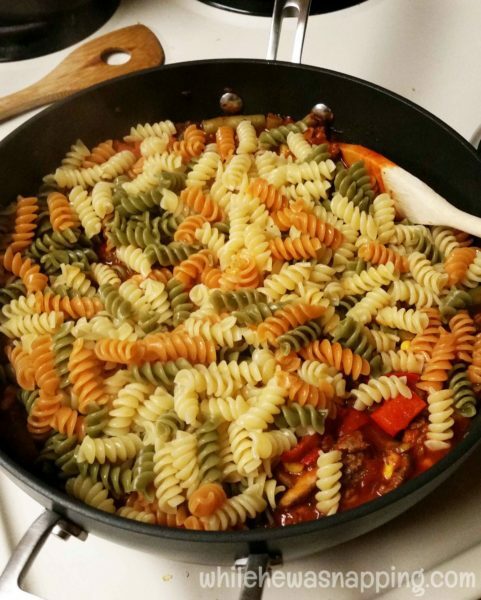 Stir in the Ragu pasta sauce and mix until the sauce coats the meat and veggies evenly. Simmer on low on the stove while the pasta cooks. Drain the pasta and rinse, if desired. Add the pasta to the sauce and mix until the pasta is evenly coated. My kids eat this up every time I make it. They love it! I love that it’s easy to make, it’s a delicious crowd-pleaser and it totally nostalgic for me. I always get flashbacks to family dinners and trips to Grandma’s when we have this. I hope it’s something that my kids will pass onto their families when they get older – share with their wives and kids. Every lady loves a man that can cook. My grandma always makes her own tomato pasta sauces, but my mom always used Ragu pasta sauce. I love the option, because with my busy life and busy boys, I don’t always have the time or energy to make my own sauce. I love that Ragu pasta sauce is a part of this tradition and that it is a sauce that I can count on to deliver quality flavor. While working on this post, I was able to learn more about the origin of Ragu and the woman who started it all. Assunta Cantisano was a woman with a dream. Assunta came to America from Italy and brought her family’s recipe for tomato sauce with her. Her neighbors loved it. And so did her neighbor’s neighbors. 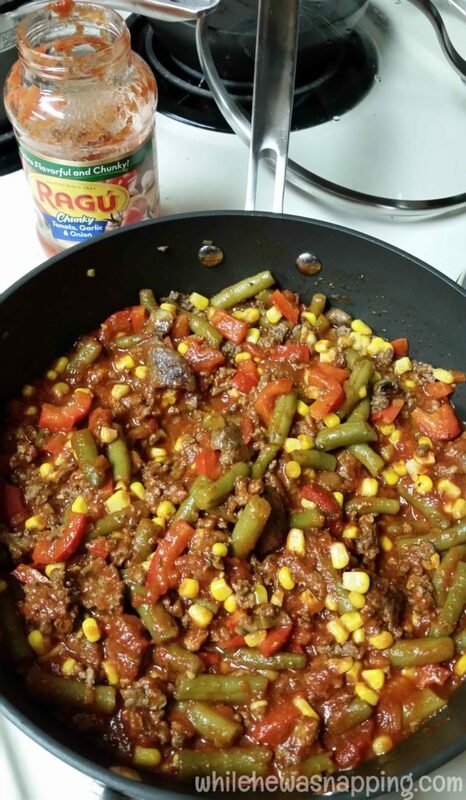 Before too long, people were grabbing it off of store shelves in Iowa and the Ragu tradition was off and running. Great success story, right? But it wasn’t easy fame and fortune for Assunta. She grew up during the Great Depression and she struggled as a single mom. Her hard work and perseverance clearly paid off. When people didn’t have much of anything, she gave her all to share her sauce with others. 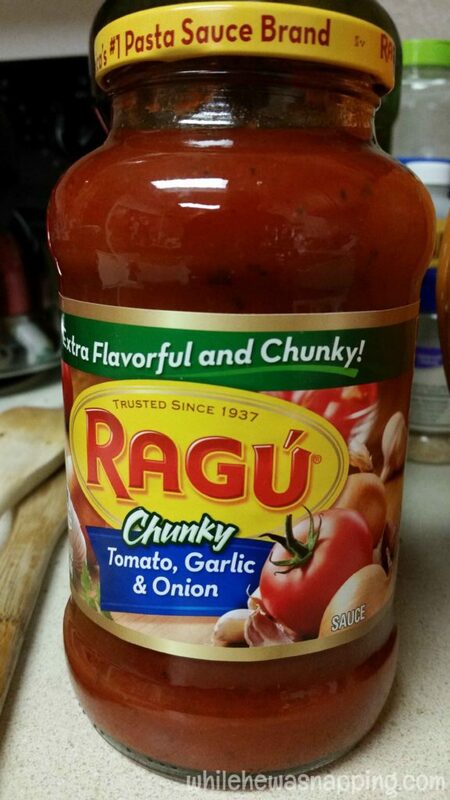 Since Ragu was born hundreds of pasta sauces have graced the shelves over the past 80 years, and has even gone on to become America’s number one pasta sauce. Do you like to experiment in the kitchen? Right now, food.com has a contest running called Ready. Set. Cook! and they have issued the challenge to create new and unique recipes featuring Ragu sauce plus a set list of other ingredients. Think you’re up to the challenge? Check out the Ready. Set. Cook! contest over on food.com. I love traditions and sharing them with my kids, especially this time of year. What are some of your favorite family traditions?